Like everyone else in the planet, I'm reading Steve Jobs' biography. Finding the origin of his character and taste is truly fascinating. Like the influence of his very first home on his perception of what design for the masses should be. Jobs' first home was a Joseph Eichler-built house. Like many people in California, Jobs' adoptive parents lived in one of the 11,000 homes built by Eichler in 12 communities all over that state. 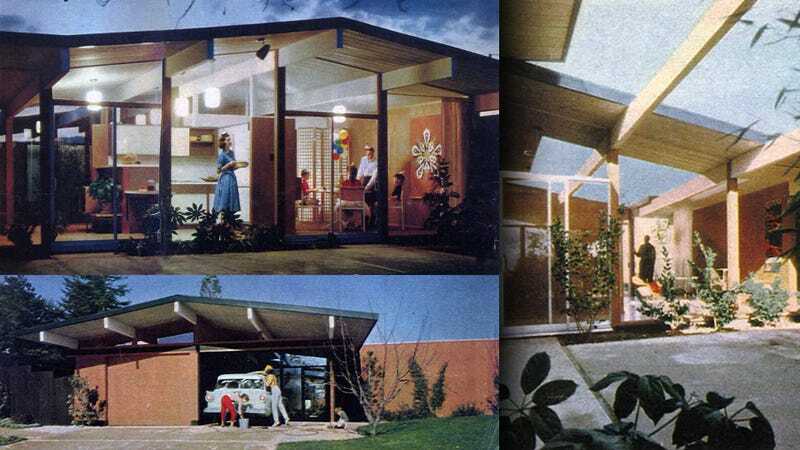 The Eichlers, as they are commonly known, are simple, clean, single-story open-plan houses, with exposed wood beams and large, top to bottom glass panels. Eichler was influenced himself by Frank Lloyd Wright, as he lived for a while in one of the famous architect's Usonian houses. Wright coined the word Usonia to refer to his idea of architecture and landscaping for the common American citizen, home designs that were simple, small and embedded in the environment. The real estate developer thought he had to bring Wright's design philosophy to the masses and he succeeded.